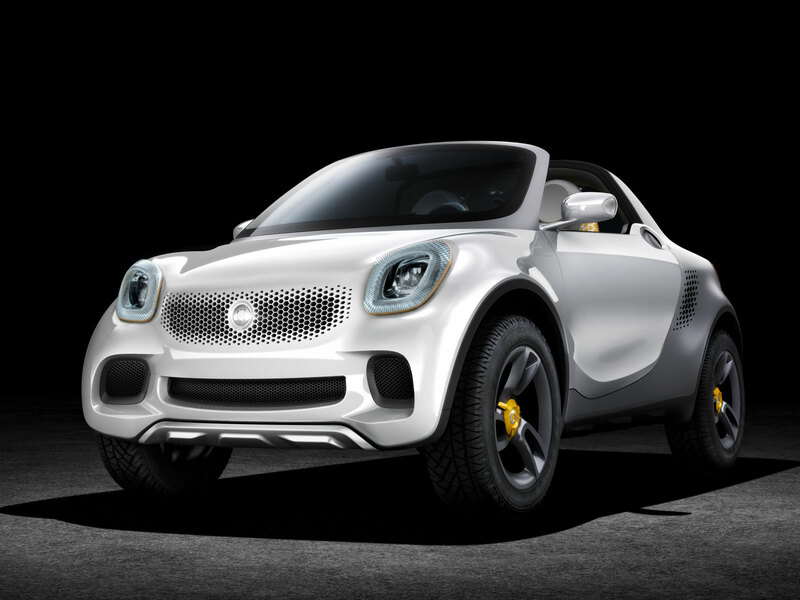 Following the sketches released last month, Smart has published new images and photos of the for-us, a compact pick-up concept equipped with the electric drivetrain that will be featured on the ForTwo electric drive, that will go on sale on next spring. The drivetrain combines a 55 kW magneto-electric motor with a 17.6 kWh lithium-ion battery and allows a top speed of 120 km/h. The rear loading area can hold two smart ebikes, that can be charged during the journey. The design builds on the forspeed and forvision concepts, and combines the typical styling cues of the brand with a robust appearance. For more details on the design check our previous article, or read on for the official details released by Smart. Compared with the series-produced fortwo the smart for-us makes a powerful statement and its appearance plays with the martial image of conventional mega-pickups. The large brand emblem is proudly sported on the grille, and the front has a pronounced three-dimensional design with an underride guard finishing off the lower part of the front end. 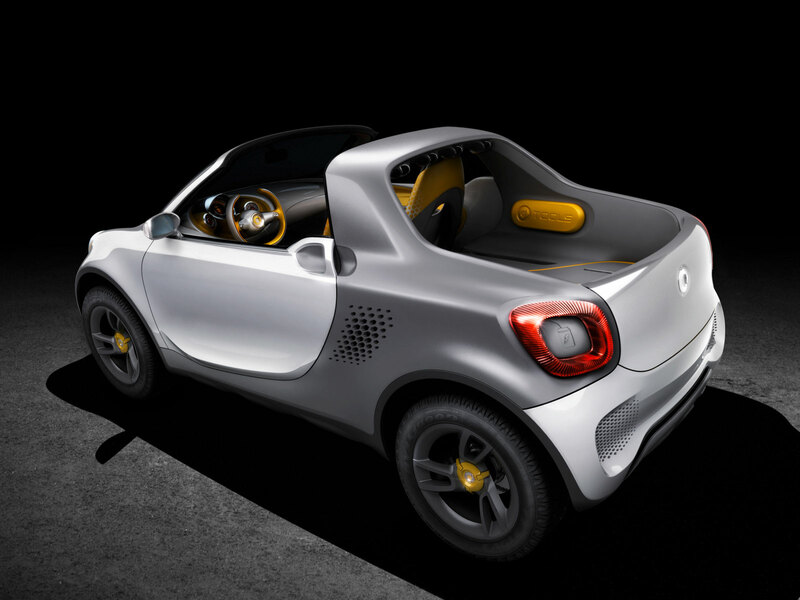 The for-us is raised by 50 millimetres as against the standard smart. In a later development stage the electric drive could be extended in the direction of a 4×4 with two front wheel hub motors. The longer wheelbase (2480 mm/plus 613 mm) and the track that has been widened by 50 mm on each side also emphasize the robust look of the study. At the same time the extremely short overhangs at the front and rear make it exceedingly compact and provoke supporters of conventional pickups. The smart for-us rolls on Michelin off-road tires measuring 235/55 R 18. The wing nuts of the central mounts of the three-spoke wheels are an attractive detail: they fold out and then serve as a lever to release the wheel nuts. The design of the rhombic front and tail lights is very striking and is reminiscent of the design of the smart forvision, which caused a stir at the Frankfurt Motor Show in September. The outer rings illuminate the indicators and daytime running lamps with a large number of rod-shaped LEDs. The lamps seem to push outwards like arrows – like drops on the cockpit window of an airplane as it takes off. The tail lights can even be opened and provide stowage space, for example for the charging cable or drinks cans for sporty bikers. The tailboard at the rear of the smart for-us is electrically driven. Remote control or touching the integrated touchpad retracts the cargo floor including tailboard by 280 mm, and the tailgate then slides down in a parallel position. The cargo on the 900 mm cargo area is then extremely easy to access. The high-gloss white metallic paintwork of the smart for-us with the tridion cell in a grey textured finish also builds a bridge to the smart forspeed presented at the 2011 Geneva Motor Show, and to the smart ebike. 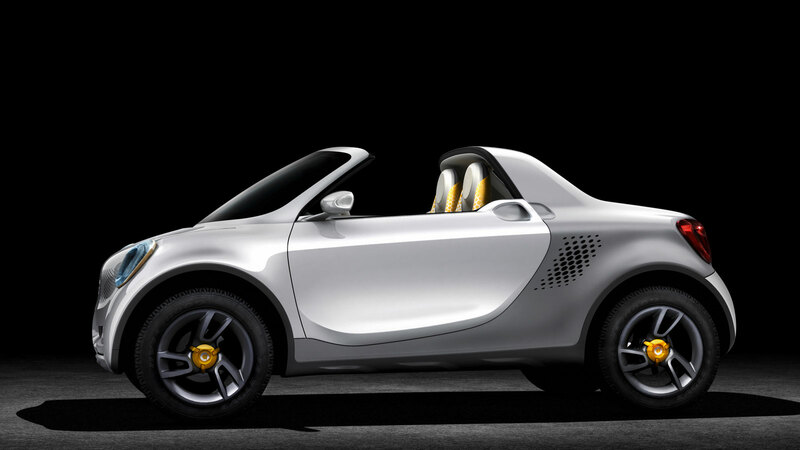 On the other hand, the honeycomb structure of the air inlets takes up an aspect of the smart forvision, which debuted at the Frankfurt Motor Show in September. The subtle color accents in a warm yellow establish a further visual link to the interior. The interior is characterized by the contrast between the surfaces in mother-of-pearl white and the functional elements in brushed aluminum. The white metallized leather establishes a link to the instrument panel, which in turn is related to the body. The headrests featuring metallic leather are a reference to the matt-finish textured paint of the tridion safety cell and – in line with the clean design – they largely dispense with seams. Yellow adds highlights to the interior, for example on the seat belts and seat covers. Leather door trim provides a further high-quality contrast. Like in the smart forvision, the whole cockpit boasts aerodynamic styling for interior ventilation. The control and display elements are oriented to the driver. Just as the cockpit module divides the instrument panel, the two-spoke steering wheel is open at the top. In place of a conventional rear-view mirror the smart for-us features a smartphone accommodated in a holder on top of the instrument panel support. The driver can see what is happening on the road behind with the help of an integrated video camera. 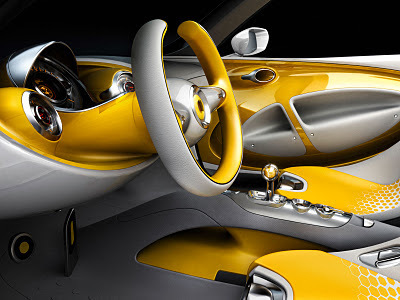 Stylish, uncomplicated, highly functional and easy to individualize – the two seats in the concept car are typically smart. The seat shells, which are open in the middle, are covered with a soft fabric throw giving them a hammock-like seating feel. When the seat cover on the passenger side is removed long items can be loaded through the seat of the smart for-us. The study has yellow seat covers with a deep embossed silver hexagon pattern indicating a progression and thus emphasizing the vehicle’s dynamism. As the covers can be removed in no time at all. The seats could even be used as avant-garde seating at home or when spontaneous seating is needed outdoors. 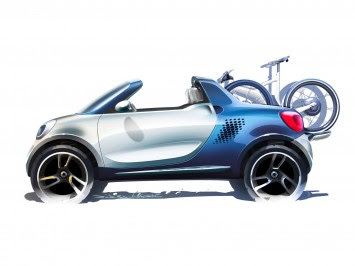 The cargo space has two slits for the front wheels of the smart ebikes. A special docking station in the middle enables the ebikes to be charged whilst being transported on the smart for-us. And bicycle tools or other items can be accommodated in the stowage compartments on the right and left of the load space.